We are glad to inform you that the therapeutic and sanitary hotel complex “DiAnna”suggests the Loyalty Programme to its permanent customers. The Loyalty Programme provides our guests with an opportunity of accruing bonuses and exchanging them for pleasant gifts as well as enjoying exclusive privileges. • The holder of the Loyalty Card gets the right to an increased discount (but no more than 20%), depending on the amount of money spent while staying in the health-improving complex, as well as benefits when booking a room, flexible settlement time, guaranteed parking space and a number other benefits according to actions and activities in the health-improving complex. • The loyalty program of the regular guest does not work if the guest book the number through the company with which the hospital and hotel complex has entered into an agreement. The program of the permanent guest acts in case of any type of payment (cash, credit card or cashless form of payment), which is carried out directly by the Guest. • Flexible system of settlement time is provided in the presence of vacancies in the hotel. • Programme discounts are individual and are provided to the Frequenter’s Card holder for the room he will reside in. 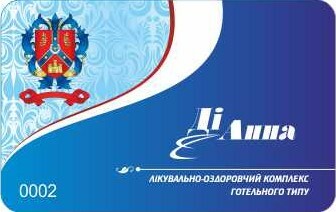 A classic card is provided to customers who spent a total of 5,000 UAH and more on accommodation in a hotel. Owners of such cards are entitled to a 5% discount* for accommodation services, additional hotel services and free early check-in on availability. The Classical Card – 5% – a customer loyalty card of a permanent guest with the right to hand it over to relatives or best friends. The card gives you the right to book rooms and order packages for relatives and close friends with a 5% discount. To transfer the club card, the holder must confirm the transfer of the card in writing, indicating the card number and the identity of the person to whom the card is transferred. To confirm, you need to send a letter to the e-mail info@dianna.com.ua or by fax +38 (03248) 48 038. Guests who visit the complex must have a discount card. The silver customer loyalty card is provided if you have used the services of accommodation in the complex for the sum of 100 thousand UAH and more. Owners of the card have an opportunity to receive a 10% discount * for accommodation services, services in the Jambo restaurant complex and free early check-in or late check-out, subject to the availability of vacancies, along with the possibility of ordering special services from the hotel, special discounts and offers. The Silver Card – 10% – is a discount card with a right to hand it over to relatives or best friends.To transfer the club card, the holder must confirm the transfer of the card in writing, indicating the card number and the identity of the person to whom the card is transferred. To confirm, you need to send a letter to the e-mail info@dianna.com.ua or by fax +38 (03248) 48 038. Guests who visit the complex must have a discount card. -20% – is a discount card of a frequenter without a handover right. A card of this type is provided if you have used the services in total amount of 300 thousand UAH and more. Provides a 20% discount on accommodation for additional services of the hotel complex and services of the “Jambo” Restaurant. Owners of such cards also have the right to a free early check-in and late check-out, subject to availability of vacancies. -To cancel a discount card in case a customer breaches the conditions of residing in the hotel. For more detailed information contact us by phone: +38 (03248) 48038. The programme does not cover corporate clients of companies, firms and enterprises, customers from tourist agencies and tour operators the hotel has entered into a contract with as well as individual tourist groups. Loyalty programme discounts do not cover the price of additional berth. “Frequenter” loyalty programme participation registration is implemented by submitting an application and a further receiving of a personal number. The application may submitted in person or via the hotel website. We will be glad to see you among our frequenters enjoying the benefits of the loyalty programme.